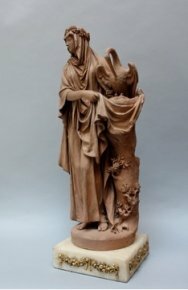 12/5/14 - Acquisitions - Montreal, Musée des Beaux-Arts - The Musée des Beaux-Arts in Montreal recently added several important pieces to its collection of European sculptures, purchasing notably its first 18th century terracotta, Marie Antoinette as Kindness by Robert Guillaume Dardel (ill. 1 and 2). A student of Pajou, who failed the contest for the Prix de Rome, Dardel specialized in small formats, terracottas and bronzes. Between 1781 and 1787, he exhibited at the Salon de la Correspondance, a private event created by Claude Pahin de la Blancherie, which allowed artists, particularly those not belonging to the Académie Royale, to show their productions. It was there he presented Louis XVI Led by Wisdom in 1781 and in 1786 the statuette of Marie Antoinette acquired today by the Musée des Beaux-Arts in Montreal. Despite these signs of deference to the court, the sculptor later took up the revolutionary cause. Marie Antoinette is thus depicted as an allegorical figure which Cesare da Ripa and Jean Baudoin describe as "dressed in a robe of gold gauze and wearing a street crown, her eyes gaze at the sky, a pelican in her arms and at her sides a verdant tree on the banks of a river." Although the river and the gold gauze dress cannot be interpreted by a terracotta statuette, the other attributes are indeed evident with the tree reduced to a trunk covered by leaves. According to legend, the pelican tears its entrails to feed its young with its blood. The work stands on a marble base decorated with gilt bronzes. It as acquired from the Patrice Bellanger Gallery. This beautiful addition was joined by several other sculptures over the past few years, dating mainly from the late 19th century. This includes another purchase from the Bellanger Gallery, and is an explicit tribute to the late Patrice Bellanger. This is a superb enameled stoneware piece (ill. 3), in perfect condition, by Jean Carriès, a major artist which the dealer had discovered and brought to light again in a pioneering exhibition in 1997. The subject of this bust is The Man with the Bells or The Forlorn Jester for which there are two known versions, one at the Francine & Sterling Clark Institute, in patinated bronze plaster and the other one at the Petit Palais in Paris, also in stoneware. Although the plaster dates perhaps from 1882, the two stoneware versions were no doubt produced ten years later and one of them, maybe the one in Montreal, was exhibited in 1892 by the artist at the Société Nationale des Beaux-Arts where he presented over 130 works. 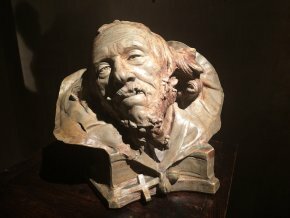 This representation of a jester is part of a series which Carriès entitled "Desolated" which he began to work on about 1879 and about which Amélie Simier, a specialist on the artist and curator of the exhibition highlighting his work at the Petit Palais in 2007/2008, writes "this is the first coherent ensemble of accomplished works in which Carriès is fully himself", underscoring that "the portrait of these marginalized characters is a literary theme in the poets the artist read or knew." Late last year, the museum also added an important bronze by the Belgian artist, Jef Lambeaux (ill. 4) to its sculpture collections. Practically unknown in France, this sculptor is quite famous in Belgium, and correctly so when considering his masterpiece in Brussels, the relief of Human Passions, held in a pavillion bearing his name and built by Victor Horta in the Parc du Bicentenaire, of which there is a plaster version at the Musée des Beaux-Arts in Ghent. 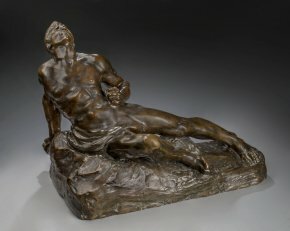 According to Bruno Fornari, an authority on this artist, this unpublished bronze is probably a unique casting which might well be a three-dimensional replica of a suicide figure at the center of Human Passions. Like Rodin with his Gates of Hell, Lambeaux interpreted various of the figures in his large relief as independent statues. The work was acquired directly from the estate of a private collector and it is the first by this sculptor to join a Canadian collection. Next article in News Items : The Samaritaine’s Construction Permit Cancelled !